Regret to upgrade iOS 11.4.1/11.3 to iOS 12? Here's how to downgrade iOS 12 to iOS 11 right now on your iPhone iPad iPod touch without losing any data. Check the complete guide on the downgrade preparations, how-to steps, and iDevices restores. As soon as every update of iOS, I rushed to install the new system to my iPhone. iOS 12 is no exception. I don't know how many people are in such case, but I wish I had never upgrade to iOS 12 right now since it's buggy, really buggy. After the upgrade, you may be plagued with iOS 12 glitches and bugs as a result of update, such as the battery issues, the lock screen issues, apps running trouble or iOS 12 update bricks iPhone, leading many ordinary iOS 12 users go back to iOS 11. Even when I update to iOS 12, things don't go much better. No matter what the causes, if you have upgraded like me and wanna return to previous versions, check out how to downgrade iOS 12 beta to iOS 11 step by step. iOS 12 vs iOS 11: Which Performs Faster and More Stable on Old iDevices? As with any iOS update and downgrade, you should be careful to back up all your data and settings in case of any data loss after you switching to another version. 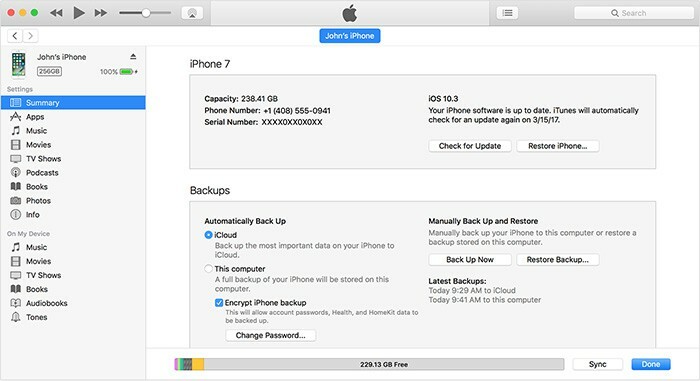 To downgrade iOS 12 beta without losing data, you should back up your iDevices specifically and then archive the backup. Here are various ways to do so. But iTunes and third-party software such as MacX MediaTrans undoubtedly works like a charm on iPhone data backup before iOS downgrade. This option is ideally suited to those who don't want to backup iPhone over Internet. In such case, connect your iPhone and Mac computer with a USB cable and backup iPhone data to iTunes, which will be easier to archive the backup after upgrading to iOS 12 or downgrading iOS 12 to 11.4/11.3/11.2/11.1 or previous version. 1. Open iTunes and connect your iPhone to your Mac with a USB cable. 2. Enter your passcode and 'trust' the iPhone, if you get such a message. 3. Select your iPhone when it appears in iTunes. And go to "Summary" Tab. 4. Click "Back Up Now" if you don't need to save your Health and Activity data. Or else, you need to encrypt your backup: Select the box called Encrypt iPhone backup and create a memorable password before iPhone backup. 5. After the process ends, you can see if your backup finished successfully in iTunes Preferences > Devices. This is an iTunes alternative way for iPhone backup, which is superior to iTunes indeed. It simplifies the iPhone data backup steps of what iTunes does; supports files backup selectively or at a whole as you desired; offers two-way sync data between iPhone and Mac and gets rid of the iCloud space out-of-storage problem. All these make data backup and iOS data recovery easier in iOS 12 to iOS 11 downgrade. So free download MacX MediaTrans and have a try! 1. Access MacX MediaTrans and connect your iPhone to the Mac computer using a cable. If a message asks for turning off iTunes auto sync in case of any data loss, follow the onscreen steps. 2. Choose the file type you wanna backup on the main interface, from photos, music, video, book, to ringtone & voice. Take "Music" as an example. 3. Choose the music you wanna transfer or check "Select All" box and then hit "Export" button to back up iPhone music to Mac. BTW, photos, videos and other iPhone files backup goes the same steps of music backup. Step 1: Download previous iOS IPSW file. Downgrading from iOS 12 to 11.4/11.3/11.2/11.1 requires you to download previous ipsw file first. Visit ipsw.me to check the iOS 11.4.1, 11.3.x, iOS 11.2.x or iOS 10.1 ipsw file for your iPhone. If there is signed iOS ipsw file available, just download the file to your computer. Currently, iOS 11.4.1 ipsw is available with signed IPSWs. If you're willing to downgrade iOS 12 to previous version, the IPSWs are unsigned, which means you cannot restore to it in iTunes. Step 2: Turn off Find My iPhone. Go to settings > iCloud > Find My iPhone. Enter your password and then click on 'Turn Off'. Step 3: Connect your iOS 12 iPhone to your Mac computer and launch iTunes, then go to the device Summary. Step 4. Put iPhone into DFU mode. Press the "Power" and "Home" buttons at the same time. After Apple logo appears, release "Power" button but still hold on "Home" button till you see "Connect to iTunes". iTunes will alerts that it has detected an iPhone in recovery Mode, and asked you to restore your device. Agree to restore your device by clicking "OK". Step 5: Release the Home button. And now click on 'Restore iPhone' on iTunes. Step 6: Locate the IPSW file that you downloaded earlier and then click on it. You will see a pop up window telling that you are going to downgrade iOS 12 to 11.4/11.3/11.2/11.1, and the process will erase all data on your device. Once it's done, you'll see the Hello screen, and with that it's done! 1. Get ready for your iCloud backup and make sure it's the latest one. 2. Erase all content and setting of your iPhone XS/XR/X/8/7/7 Plus/6S/SE. Just go Settings → General → Reset → choose Erase All Content and Settings. 3. Follow the onscreen setup steps until you reach the Apps & Data screen, then tap Restore from iCloud Backup. 4. Sign in to iCloud with your Apple ID. And choose your target iCloud backup. Now stay connected and wait for a progress bar to appear and complete. Of course, you can restore iPhone with iTunes after iOS 12 to 11 downgrade. If you have met any iPhone won't restore issues, you can switch to iTunes. Similarly, open iTunes and connect your iPhone to Mac, then select your iPhone. Select Restore Backup in iTunes. Look at the date and size of each backup and pick the most relevant. Click Restore and wait for the restore time to finish. If asked, enter the password for your encrypted backup. Keep your device connected after it restarts and wait for it to sync with your computer. You can disconnect after the sync finishes. You can also read the guide to restore backup and set up your iPhone after downgrade. To the bottom line, here you gotta know how to downgrade iOS 12 and go back to iOS 11.4/11.3/11.2/11.1. Before everything, remeber to make an iOS backup of your iPhone indeed in case of any data loss. Better safe than sorry. There are many reasons why you can't download iOS 12/11. You'll run into iOS 12/11 download stuck issue if your iPhone iPad don't have enough storage, or battery, or good wifi connection. Follow our top 10 tips to solve iOS 12/11 download stuck problem. Some people have gradually found some iOS 12 problems after trying the new beta version. Here is a list of 32 most common iOS 12 issues people may meet, and listed the potential fixes to solve these issues. 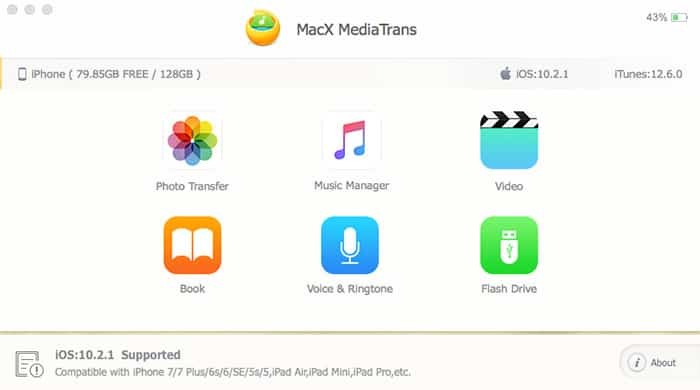 MacX MediaTrans is an all-in-one iPhone data manager which will backup videos, movies, music, books, iTunes purchases etc from iPhone iPad to Mac in one click. Backup data and make space for downgrading iOS 12 to iOS 11.